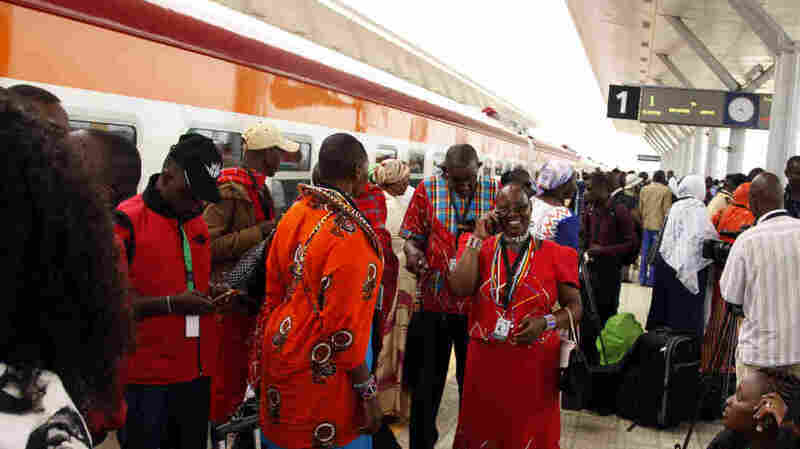 Kenyans Cheer Opening Of Mombasa-Nairobi Railway : The Two-Way The line was financed with more than $3 billion borrowed from the Chinese government. A Chinese company built it, and a Chinese company will operate it for the first five years. 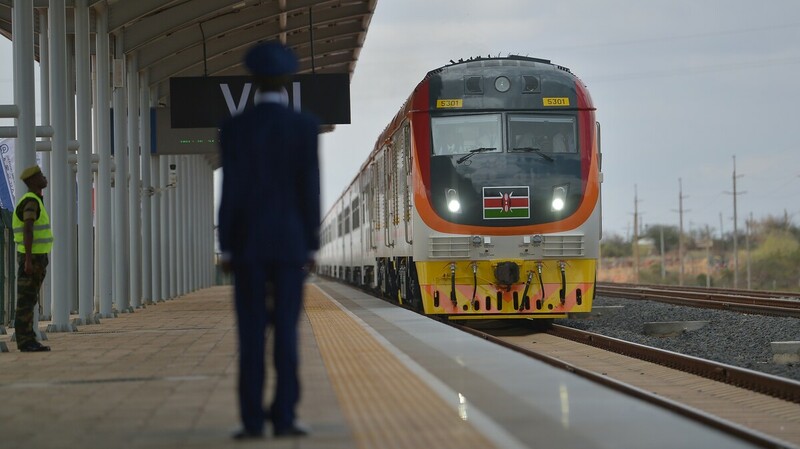 A standard gauge rail locomotive carrying Kenyan President Uhuru Kenyatta pulls into the railway station in the city of Voi on Wednesday, during an inaugural ride on the railway from Mombasa to Nairobi. Just after the sun rose on Wednesday, people began streaming into the Mombasa terminal station. There was a red carpet, a helicopter and Kenyans dressed in their very best attire, with shimmering fabrics and dazzling hats. A little more than a hundred years after the British built a railway through their East African colony, Kenyans celebrated building one of their own. Consolata Muvea took a bus more than 10 hours to come to Mombasa for the first time and she was entranced by the train waiting at the station. "I understand there is tea. There is a toilet. I want to see even the type of toilet is there," she said laughing. "Because if I hear that there is a toilet there, I just imagine. How? I am always traveling by bus and there is no toilet. How can there be a toilet here? So, I am happy." Peter Asiokomweka, 69, was marveling at the machine in front of him. It's a diesel locomotive because Kenya didn't have the infrastructure to pull off an electric train. Still, moving at around 65 mph, it is going halve the time it takes to get from the port city of Mombasa to the capital city of Nairobi. "This one is going to make our country richer than it has been," Asiokomweka said. He looked around at the terminal, a modern building with swooping lines and a tower that reaches high into that vast African sky. He was awed. He says the building of this train is already overwriting the colonial legacy left by the British. Kenyans wait to board a train in the port city of Mombasa on Wednesday. The country's new Mombasa-Nairobi rail line was financed by China and built by a Chinese company. The rail line was financed with more than $3 billion borrowed from the Chinese government. A Chinese company built it, and a Chinese company will operate it for the first five years. For China, this project is part of a grand plan to revive the old Silk Road. In Africa, China imagines a vast network of rails, from Kenya, through Uganda and Burundi and up to South Sudan that can help it move its goods in and out of the continent with expediency. Speaking at the opening ceremony, Kenyan President Uhuru Kenyatta said it was a "historic moment" because the rail line will "transform the economy of this country." The government hopes cargo from the port of Mombasa will be able to flow inland faster, more efficiently and cheaper than it does moving along a two-lane highway. But critics have denounced the project for saddling the Kenyan people with debt. Back in 2013, the World Bank said it would not help finance the project and it also released a damning report questioning the project's financial logic. Kenya was already running a railway left over from colonial times. According to a World Bank analysis, refurbishing that rail would have resulted in the same performance as the new line and cost less than half of what it took to build the new railway. At the inaugural ride, however, finances were not discussed. To singing and dancing, President Kenyatta boarded the train and it began to snake its way across swaths of African bush. It's a route that the British termed the Lunatic Express, in part because lions had a habit of eating the men working on the railway. But it's spectacularly beautiful country. It's rugged plains dotted with hulking hills, and every once in a while you're likely to spot an elephant or a baobab tree jutting improbably from the ground like a prehistoric giant. And as the train cut its way from one town to another, over the course of 300 miles, one thing became certain: This was a proud moment for Kenyans. As the train lurched forward, little kids ran toward it waving and smiling, and women and men left their fieldwork and sought higher ground to get a look at this new, marvelous machine.